In the figure given above PT' is tangent to the curve at point P of the curve and PN'  is normal. 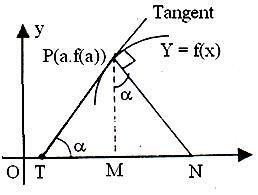 Point T is on x axis where tangent intersects it and point N is on x axis where normal PN'  meets it. TM'  is called sub-tangent and MN'  is called Subnormal. √x + √y = √a on the coordinate axis is constant. The equation of the curve is √x + √y = √a. 1/2 x-1/2 + 1/2 y-1/2 dy/dx = 0 => dy/dx=-√(y/x). y - y1 = √(y1/x1 ). The intercept on the x-axis = √(ax1 ). The intercept on the y-axis = √(ay1 ). = a, which is a constant. The curve = ax3 + bx2 + cx + 5 touches the x-axis at P(-2, 0) and cuts the y-axis at a point Q where its gradient is 3. Find a, b, c.
The point Q is (0, 5). From (1), (2) and (3), a = -1/2,b = -3/4, c = 3. Normal is perpendicular to tangent, so slope of normal = - 1/(dy/dx). 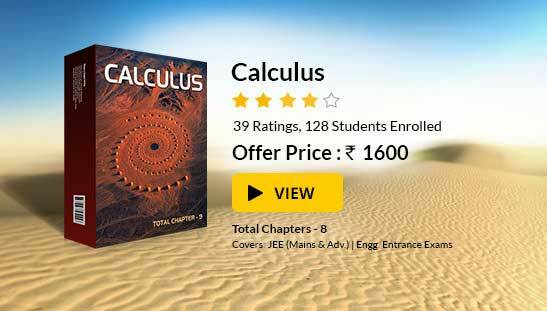 To read more, Buy study materials of Applications of Derivatives comprising study notes, revision notes, video lectures, previous year solved questions etc. Also browse for more study materials on Mathematics here.